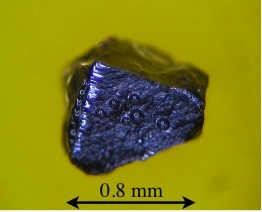 We grew high quality single crystals of NpO2, and clarified the new ordered state due to the magnetic octupolar by the nuclear magnetic resonance (NMR) measurements. The magnetic octupole order is related with the anisotropic distribution of the magnetic moment, which is induced by the quantum behavior of spin and orbital. This is "spontaneous symmetry breaking", which is universally observed as a physical phenomenon. High quality single crystals and microscopic experiments put an end to the half century mystery. This result was published in Phys. Rev. Lett., and was reported in "Kahoku Shimpo" and "Nikkan Kogyo Shimbun" on Dec. 20, 2006, as well. The work has been done in collaboration with Japan Atomic Energy Agency.